The Hole frontwoman is writing a memoir, but these unforgettable episodes are already public record. Love has already published one memoir, 2006’s Dirty Blonde: The Diaries of Courtney Love,which compiles everything from hand-written notes and diary entries to a Mickey Mouse Club rejection letter. In the meantime, who needs a tell-all book? As those of us trying to hold onto our appreciation of her greatest songs are all too aware, Love’s life in the spotlight has already provided plenty of memorable — and often outrageous — moments. Here are five that come to mind. 1. SMACKED OUT AND PREGNANT? In 1992, a Vanity Fair profile alleged that Love used heroin while pregnant. The story was by Lynn Hirschberg, of M.I.A.-“truffle fries” kerfuffle fame. Three years later, at a party, Love grabbed Quentin Tarantino’s best director Oscar award for Pulp Fiction and threatened to pound Hirschberg with it. As two of the toughest female frontwomen in alternative rock, Love and Kathleen Hanna might have been expected to find common cause. On the first stop of the 1995 Lollapalooza tour, however, Love belted the then-Bikini-Kill singer — and earned herself a one-year suspended sentence for assault. Love called Hannah “Raface” and accused her of enedlessly stalking Cobain while he was alive. “I still don’t like her,” Love told SPIN in 2005. At least one of Love’s more bizarre misadventures is memorialized in perpetuity on YouTube. During the 1995 MTV Video Music Awards, host Kurt Loder was interviewing Madonna, when Love hurled her compact in the pop star’s direction. An awkward train wreck ensued. 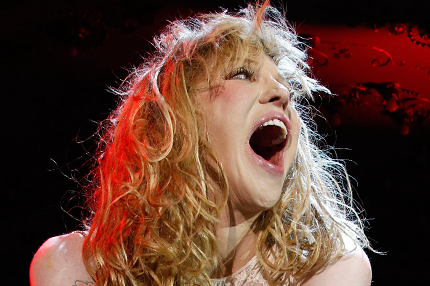 “Courtney Love is in dire need of attention right now,” the Material Girl pronounced.